The perfect built-in dishwasher solution for the growing family This built-in dishwasher has th.. 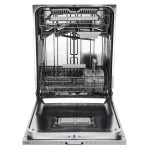 Fully integrated dishwasher with 8 spray zones and self cleaning system. No more need for manual cle..